It is well known in the branding world that the power of a brand intensifies exponentially if paired with the right branding partner, creating a unique co-branding relationship. If you join endeavors with an esteemed and recognizable brand, by sheer power of association, certain dimensions of your brand are elevated. We see this quite a bit with corporate branding. For example, you only have to think of Liberty providing the toiletry bags for British Airways first class passengers to understand how co-branding puts the power of association to work. Such brands choose their partners carefully. In the case of BA and Liberty, both are targeting the luxury market and have a traditional, heritage feel. From a branding perspective, it just makes sense. Then there are joint-branding initiatives that are rather, well, unorthodox. Take, for example, last year’s partnership between McDonald’s and designer Julien MacDonald, who came together to create the first luxury fashion burger box. This co-branding exercise breaks all the rules, mixing high and low, luxe with cheap, and yet it works. What’s more, the project ticks another great branding box with its charity element: a number of limited edition boxes are available with one special box being auctioned off for charity. More recently, we saw Burberry’s Chief Creative Officer Riccardo Tisci and Vivienne Westwood announce a collaboration for an upcoming limited-edition collection, which is all about “reimagined styles from her legendary archive”. Westwood, known for her rebellious punk edge and provocative creations, was a surprising choice for Burberry, the iconic heritage British fashion house. However, the potential here for something new and interesting from both brands is immense (and I for one cannot wait!). If we look to other unconventional joint ventures, we see that an unexpected relationship often shifts perceptions and keeps things interesting. Sometimes these ventures surprise, delight and even stir things up a bit. 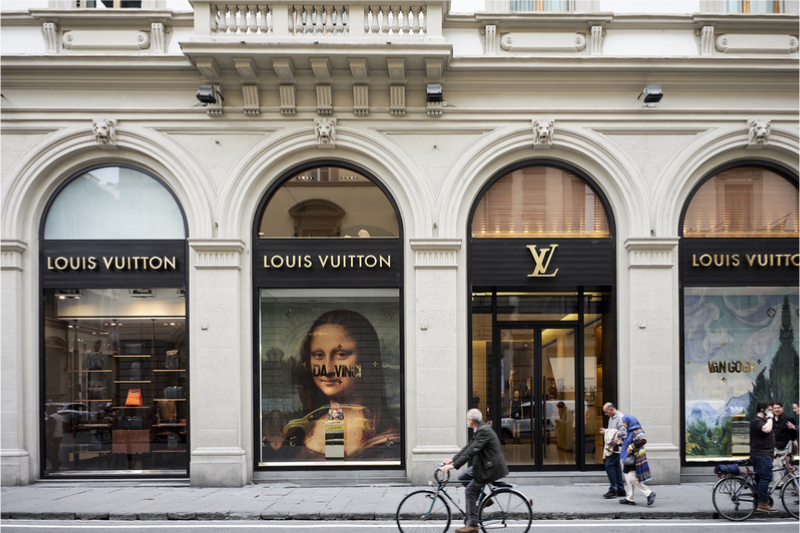 Louis Vuitton is a great example here, as the traditional French fashion house has brilliantly added an edginess to their iconic bags through their multiple collaborations with various artists. Co-branding on a personal branding level is not just a relationship between two individuals, but also the particular causes, labels, products or activities we associate ourselves with. Some associations might be rather expected. When we think of a fashion model, for example, we might expect an association with make-up, perfume or fashion brand. While Kate Moss has ticked all of the above, she also hasn’t been afraid to add different dimensions to her brand. An example here is her recent partnership with residential developers Yoo to collaborate on interiors for their luxury second homes in the Cotswolds. By the doing so, she added the element of surprise to an already well-known personal brand. Or take Lady Gaga, for example, who paired up with Vice President Joe Biden for the It’s On Us movement to raise awareness about sexual assault on university campuses. Her teaming up with Biden may seem a bit unusual, but it works, particularly given the cause behind their joint venture. There was also her recent corporate partnership with Tiffany & Co, best known for their classic (and conservative) luxury jewellery; the campaign played to the human dimension of the Lady Gaga brand, and it gave us something new and unexpected from both names. This is a great strategy if you feel your personal brand is constrained by predictability. Ask yourself if there’s something unique in your life that stands out from your overall personal brand image. What activities, interests, affiliations make you differentiated and interesting? How can you make them a more prominent feature of your personal brand? For example, while I love glamming it up by wearing my little black dress and a pair of fab heels, I also love wearing my black belt and training hard in Taekwondo. Needless to say, the martial arts angle often adds an unexpected contrast to my personal brand! London-based women’s business club Sister Snog have built strong bonds with iconic British designer Zandra Rhodes and boosted their own brand by association. Zandra, who occasionally hosts Sister Snog events in her own home, is the epitome of the women attracted to Sister Snog: strong, successful and full of character. Her proclivity for wearing purple also incidentally enhances Sister Snog’s own brand colours. While aligning your brand with a celebrity name certainly has its co-branding perks, you don’t have to have access to such personalities to become associated with “a name”. For example, is there a particular cause or initiative you feel drawn to? Who are the big organizations behind them? For example, if you are interested in HIV prevention initiatives, you might run your 5k for a charity such as Terrance Higgins Trust. Not only does your brand become associated with the UK’s largest HIV/Aids charity, it has the added benefit of creating a socially responsible angle to your personal brand. Another strategy is to engage with prominent names in your profession, connecting with them where you can. If you work for a company or institution, try arranging a notable guest to speak at corporate events or a “lunch and learn”. These engagements may just raise your own reputation by association. Co-branding can also happen on an outer brand level, particularly with personal style. A fantastic example is New Yorker Iris Apfel, who, at age 97, continues to be a bold style-maker with a powerful sense of authenticity. She brazenly rejects fashion conformity, and instead describes getting dressed as a creative act, “similar to playing jazz”. She has cultivated a unique personal style that is a spirited mix of high and low fashions, pairing Dior haute couture with flea-market finds. Her trademark owlish spectacles, signature oversized bangles and bold necklaces make her personal style most memorable. Is there something unexpected or different you can incorporate into your outer brand? For example, you may need to be suited and booted for a corporate job, but mixing in a pair of funky retro glasses can differentiate your look. Or perhaps narrow down the array of fashion labels in your wardrobe and choose one label that makes people raise an eyebrow. Perhaps it’s that quirky Vivienne Westwood bag or tartan blazer to add a little edge to your look, or the Frye biker boots that give your brand a tougher, more practical feel than the court shoes that other co-workers are wearing around the office. Or it could be a distinct style that differentiates your personal brand. Go ethical, go glamourous, go vintage, go exotic – the choice is unlimited, but it is by doing the unexpected, and doing it consistently (and authentically), that you will get noticed. The take home point? Unexpected or unconventional co-branding encourages people to take another look at your personal brand and can expand your target audience. The mere act of such a partnership can give your personal brand a more edgy, creative or surprising feel. And who doesn’t like to spice things up once in a while? Dr Lisa Orban brings together her extensive training, experience and passion in both psychology and branding. A clinical psychologist, Lisa trained and practised in New York City for eleven years before relocating to London in 2008. Lisa helps clients make a name for themselves by discovering their distinct and authentic personal brand. She takes a unique approach to personal branding that combines psychological assessment and theory with branding strategies to create for powerful and enduring individual change and personal impact.